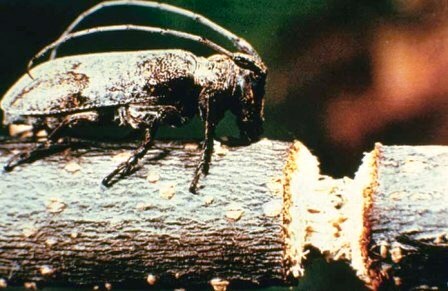 Identification: Adult is a gray-brown beetle with very long antennae. The body is covered with short hairs. 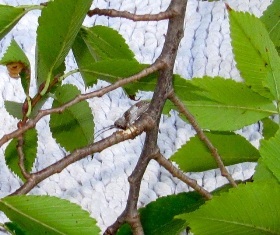 Biology and Life Cycle: Adult lays eggs on twigs, then cuts the twigs off to fall to the ground. 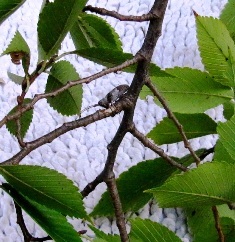 Larvae hatch and live in and eat on the fallen branch or twig. They pupate in the spring, and the adult emerges in the summer. Habitat: Deciduous forests and in individual landscape trees. Apple, ash, oak, dogwood, elm, hickory, mimosa, pear, peach, pecan, and other trees. Economic Importance: Relatively little--just a curiosity. Natural Control: Birds and ichneumon wasps. Organic Control: Destroy fallen twigs; the composting process will take care of the larvae. The strongest product I would ever spray is garlic tea to help repel the females that do the cutting. 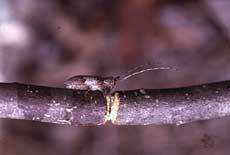 Insight: Twig girdlers can cut limbs up to 1 1/2 inches in diameter.